Every year it comes and goes with not nearly enough attention from the mass media. What am I talking about? EARTH DAY. Officially it’s Monday, April 22, although EVERY day SHOULD be Earth Day. Contrary to deniers of climate change, the planet is changing. Whether mankind is wholly responsible for this is something that’s been hotly debated. 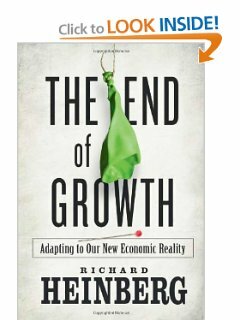 But, while experts and subsidized deniers do their hot debating about who or what caused it, and whether or not it is a normal cyclical change, it continues to get even hotter, and we still have to deal with droughts, storms, loss of shoreline, loss of species, acidification of the oceans, reduced foodstock from the sea, lack of clean fresh water and more! AUGH! Ignoring, evading, denying, and mocking the problem is not helping and all this takes precious time and resources away from actually doing something to prepare for the change that IS coming. The problem for most Americans is that we live our luxurious lives (compared to that of other nations) in air conditioned offices and homes far, far removed from the processes of farming, water purification, and energy resource extraction. We don’t have to get our hands dirty. We are only affected by increased prices. But, this somewhat blissful shelter from the realities of climate change is not going to continue for long for Americans. Soon, it will no longer be a problem for “the poor folks in Africa,” Nope, the problem is going to come home and hit us hard, and not just in the form of an extra dollar per gallon of gas. 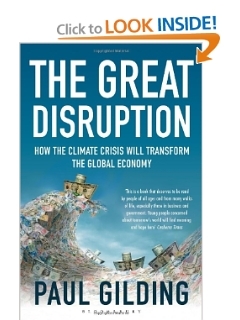 Another of my favorite volumes on the subject of "what's coming next ..."
I’ve been reading “The Great Disruption – How the Climate Crisis Will Transform the Global Economy” and I would suggest it be read by everyone. 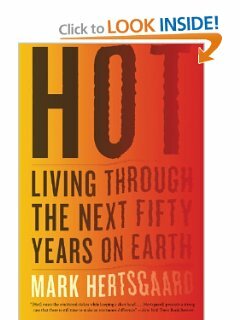 Basically, the author talks about how climate change is just one of many factors that is going to affect the way we live on this planet. It’s the kickstarter that people notice, but there are other factors such as the gobbling up of natural resources in the making of “stuff” that is going to change our idea of a successful and productive life. Simply, we won’t have the natural resources to keep making stuff; we’re going to have to recycle to get even the basic materials and everyone is going to have to live with less stuff – particularly less “throwaway” stuff. It’s a good read, but I’ve also added photos here of some of my other favorites. Take a look; pick up one of these books. Knowledge is power. Sticking your head in the sand will just irritate your eyes so you can’t see the truth. Happy Earth Day everyone! 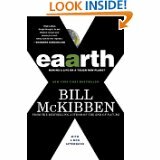 See more books and links to Earth Day websites below. Previous post: Spring is (Finally!) Springing!